Since its launch in 2016 the Meadow Vale Foods Homestyle range has proved to be very popular with caterers. In response to the success of these innovative products Meadow Vale Foods are pleased to introduce two new lines to the Homestyle range. 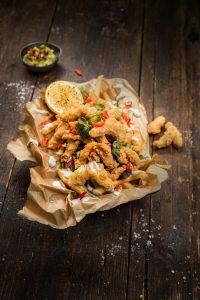 Crunchy Shredded Chicken – Chicken breast fillet strips in the trade mark Homestyle crunchy coating and Salt & Pepper Shredded Chicken – Chicken breast fillet strips in a crunchy salt & pepper coating. They are fully cooked, hand cut, whole muscle chicken breast fillets that can be cooked from frozen either deep fried or oven baked making them a great addition to any menu.